Another program I ran during Spring Break was an introduction to Scratch for kids in grades 3-6. We used the adult computer lab (divided in half) for this program. I taught myself Scratch using Help Your Kids with Computer Coding, which is a fantastic book I would recommend for all public library youth collections. I decided to also use this book as the backbone of a program. 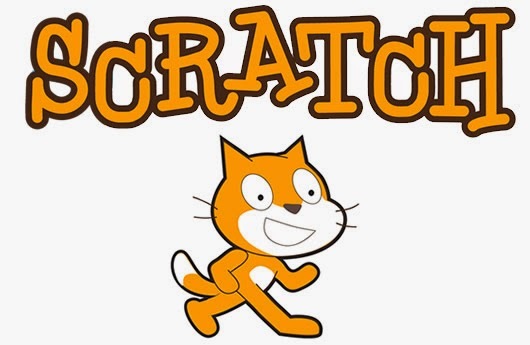 So, when the kids came in, I started by showing them some sample Scratch projects to get them excited about the possibilities. Only one of the 6 kids had heard of or used Scratch before so this was to introduce them to the idea. Then we warmed up by learning how to drag and click blocks of code together and started writing the code for the first project in Scratch, a game called Donut Breath. It took about a half hour as a group to work all the code for that project in. They learned how to use variables to create a timer and how to add sound effects. Then we spent about 10 minutes and I showed the kids how to have their game's characters (called "sprites" in Scratch) talk. I also showed them how to animate the sprites so that it looked like they were moving but using the change costume function. After that, the kids had about 35 minutes to work with their games and adapt them to their own needs. Some started whole new projects. I had created an account for the library and they used that to save to their projects. I would recommend doing it this way versus having the kids make their own accounts at first. They are able to download their own projects from the library's account by using the remix button and it saved time not having them create an account. The added bonus is that now all the projects are in the same spot! I reserved the room for a 90 minute class but I think these kids would have been happy to experiment with their projects for another half hour. It was a good mix of instructional and exploratory time. All in all, it was a complete success and I would love to teach another program in the future. Before they left, I gave the kids a postcard with the address for them to view their projects and included my email address in case they wanted to send me a link to future projects they make.